50% improvement in Job Turnaround with THIS | Industry Analysts, Inc.
Citrus College is a community college located in the Los Angeles suburb of Glendora, California, serving 18,637 students with 750 faculty and staff. The print center has four employees; including two reprographic technicians, one mail room specialist, and one supervisor. They handle 327 orders and 500 jobs per months totaling 830,000 impressions; more than 80% of these orders now come in online. 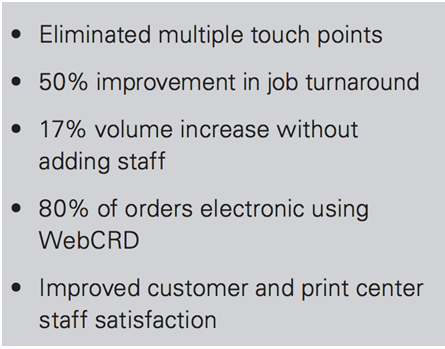 WebCRD from Rochester Software Associates (RSA) delivers all the advantages the print shop has wanted for years! This entry was posted in Rochester Software Associates and tagged Citrus College, production print, rochester software associates, rsa, WebCRD, workflow by IA Staff. Bookmark the permalink.